The beginning of the title of this blog is borrowed from Rowan Moore of the Guardian / Observer. A neat pun which expresses some of his caution about the architecture. As an ex curator myself (Minories – Ikon Gallery) I worry about the ratio of promenade space to real exhibition space. The promenade space can and does house free standing objects. The promenade space has little to no control over daylight so would be useless for any art which has any light fugitive properties. For me this circulation space has the feeling of a surrealistic shopping mall. The whoosh of the outward sloping curved wall to the right of the promenade has a gasp factor, but then what do you do after the gasp. The foyer is huge and suggests a much larger building behind, but in fact the building shrinks as you proceed down it, and yes it is downward in some places as there is some sloping to the floor. Perhaps I am too much of a traditionalist wanting conventional vertical walls for flat paintings – some might say that art practice has changed so much that walls for paintings are less necessary than hitherto. The slope and curve of these walls would make it even difficult for video projection unless you required that kind of distortion. The actual galleries when you get to them are conventional – vertically walled but they do seem quite compact after the towering space of the entrance. As to the gold sheened exterior. it’s amazing what you can do with the Terry’s All Gold concept, but the gold in Terry’s and perhaps Ferrero Rocher’s wrappings is actually disposable – kind of temporary: this is not. 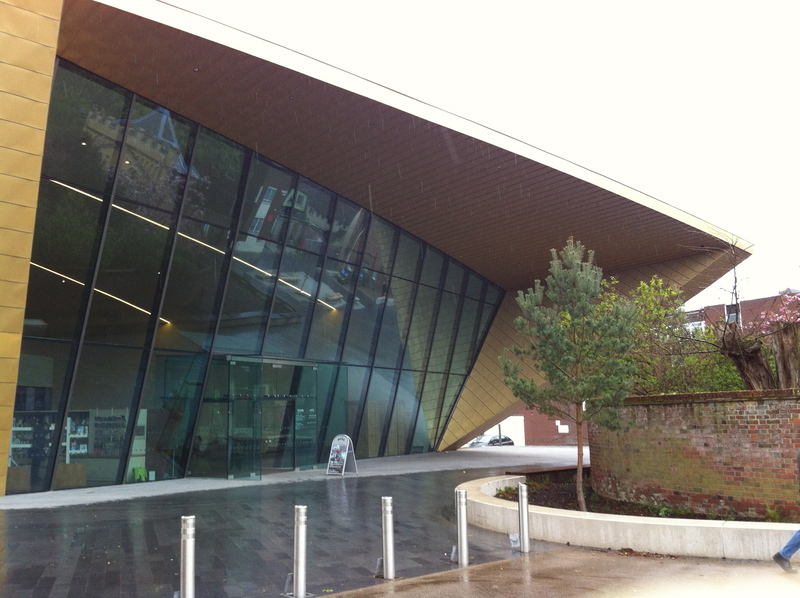 Colchester has certainly made a statement in this visual arts centre. When I worked at the Minories the the Council did not seem particularly keen on contemporary visual art, had it not been for Arts Council and Eastern Arts funding at the time I think the Council would have shown little interest in the work of the gallery. Kath Wood and her team must have done a lot to influence the Council. This entry was posted in Uncategorized and tagged rtui``§§90-==. Bookmark the permalink.